Hundreds of asylum seekers have been detained in southern Mexico in recent days as President López Obrador faces pressure from Trump administration. 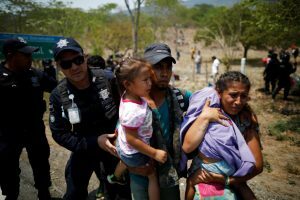 Mexico’s government has started detaining migrants marching in a caravan toward the U.S.-Mexico border, marking a policy shift as President Andrés Manuel López Obrador faces rising pressure from the Trump administration to stem the flow of migrants seeking to enter the U.S.
Should America help caravan migrants? Trump Told Mexico "we want to raise wages for Mexican workers"